Add a charming hint to both your front and back door with these Esschert Design Black Rubber and Coco Fiber Extra Long Scroll Doormats. Placing these hardy mats near your front and back door invites guests to wipe their feet prior to entering, keeping your floors tidy. Elegant scrollwork and fleur-de-lis shapes create the sturdy, rubber frame of each piece, while a rectangle of coco fibers occupies the interior. Horizontal lines throughout this section create a fantastic shoe cleaning spot, and help the fibers remain beautiful and in place. 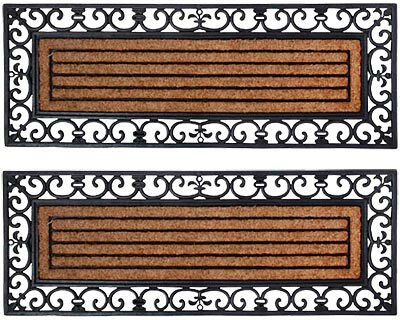 The black and brown color scheme enhances your setting in moments, and this set of 2 mats brings a unified look to your doors. The units rinse clean with a garden hose as needed, and their 47.25" length makes them fantastic for use either vertically or horizontally. Help keep your floors clean by adding these Black Rubber and Coco Fiber Extra Long Scroll Doormats to your home entries. Note: This case pack contains 2 of the Esschert Design Rubber and Coco Fiber Extra Long Scroll Doormats, Black.